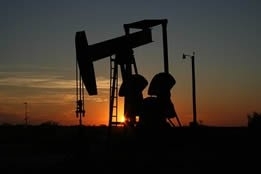 With the familiar elements of global economic concerns pitted against the perception of tightening global crude supply - combined with news of robust U.S. demand for distillates - Brent rose 71 cents on Wednesday to settle at $62.69, while West Texas Intermediate gained 35 cents to settle at $54.01 per barrel. Also factoring into Wednesday's performance was a stronger U.S. dollar, which limited gains because it makes U.S. commodities more expensive for holders of other currencies. Despite widespread fear that demand for crude will plummet because of weakening economies, the weakening apparently doesn't apply to the U.S.: Washington reported that domestic crude inventories rose less than expected last week, by 1.3 million barrels (compared to expectations of 2.2 million barrels) even though refineries increased output. March 2 "is the most important date in the calendar for oil traders." And while it's unclear what influence America's good health will have on traders in the near future, Carsten Fritsch, analyst for Commerzbank, said, "All in all, this report is bullish for crude oil and refined product prices." But in a sector obsessed with geopolitics, the factors contributing to a tentative bullish sentiment could easily be obliterated by a single event, and John Kemp, commodities analyst for Reuters, warned on Wednesday that March 2 "is the most important date in the calendar for oil traders." That's the deadline for the U.S. and China to reach a trade deal before U.S. tariffs increase on $200 billion worth of Chinese imports; Kemp noted that "The outcome of trade talks will have a decisive influence on the oil consumption outlook for the rest of the year, since the threat of tariffs and associated uncertainty are proving the largest drag on global economic growth." While acknowledging that the Americans have so far not suffered the declines in manufacturing demand or other business plaguing many other countries, Kemp went on to state that "If the economy slides into an extended slowdown, or worse an outright recession, distillate prices will come under renewed pressure and take crude prices down with them." For the record, U.S. president Trump reaffirmed in his Tuesday State of the Union address that a trade deal was possible with China, and senior U.S. and Chinese officials are scheduled to start another round of trade talks next week. Another sign that the U.S. may prevail in successfully drawing the trade war to a close came on Wednesday, when it was reported that the first U.S. oil shipments to China in months, which left Texas ports in December, will reach their destinations in several days. But observers are loath to declare a victory yet: Hillary Stevenson, director of oil markets and business development at Genscape, remarked, "While the oil deliveries are promising, the fact no subsequent ships are set to arrive after the tariff deadline shows you the pace of the trade discussions. "We just have to wait and see; China is buying U.S. crude again, but not at its old pace." Move 'one more step towards the implementation of ambitious LNG bunkering project'.